Digital transformation is the next big thing in government. But it encompasses much more than keeping up with the latest technology trends and gadgets. For government, digital transformation requires serious cultural change within organizations and strong leadership to help workforces adapt to new processes and technologies. 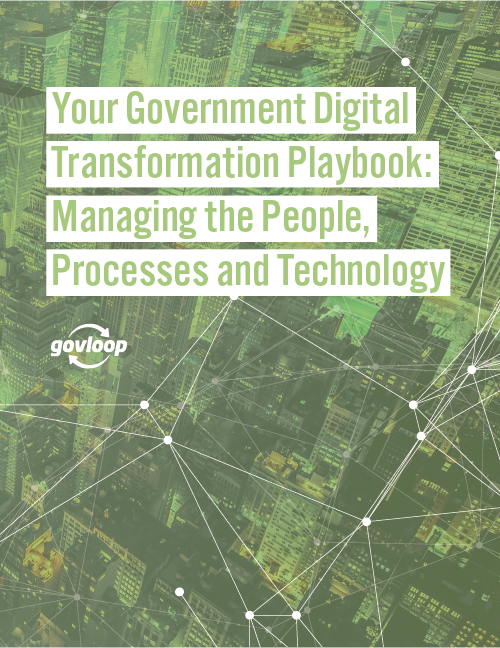 Whether you’re the senior executive leading the charge on digital transformation, the technology expert putting the digital tools together or the end user the changes affect, GovLoop’s latest guide is for you. Use this playbook to help you manage and navigate the people, processes and technology involved in digital transformation. Specifically, this guide will provide insight from government leaders who’ve been there and case studies showcasing successful digital transformation to help you identify ways to help your organization’s workers adapt to new technologies and processes. When done right, digital transformation can yield tremendous results for government, such as improved customer service, cost savings and a more empowered workforce. But to achieve success, you must consider all the components of digital transformation: the people, processes and technologies.